If there is one thing that scouts love to do, other than building a big fire, it is shooting .22 caliber rifles! On a very cold day in early December, troop 353 had a large turnout of eager marksmen (and women!) 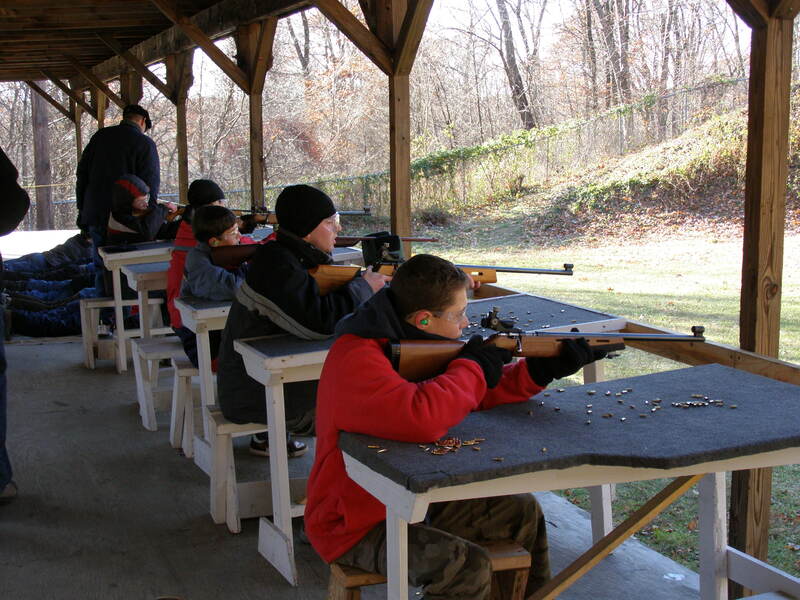 drive over to Camp Bullowa in Rockland County for a day of rifle shooting. As a testament to the venue’s popularity, every year this event turns out to be one of the most heavily attended, and despite the often frigid conditions. 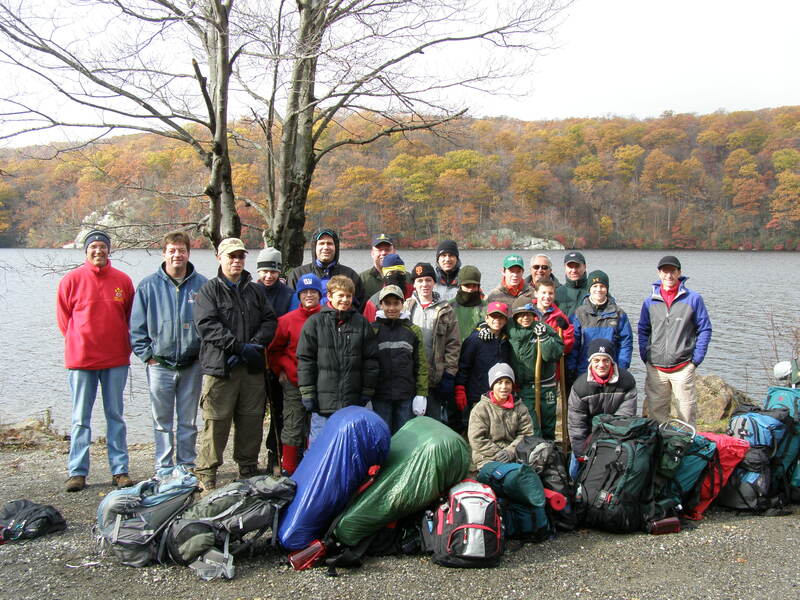 Our troop is fortunate in that we have a relationship with the very generous J. Burkhardt, an executive associated with the NRA, and that the Hudson Valley Boy Scout Council allows us to use their rifle range at Camp Bullowa free of charge. Mr. Burkhardt provides the small bore rifles, the ammunition and eye & ear protection. Last year, 15 scouts shot more than 7,000 rounds of ammo. This year, two dozen scouts and several adults (including one mom!) easily exceeded last year’s total ammo fired. In a shooting contest, top sharpshooters included Andrew H., Michael W., and Matthew S.
Given the large number of young scouting participants & a limited number of open slots on the firing range, troop leaders opted to complement the shooting with advancement activities. Many scouts brought completed 2nd Class (identify 10 kinds of wild animals) and 1st Class (identify 10 kinds of native plants) requirements with them. Other scouts brought along their recently prepared first aid kit. While not shooting, SPL Conor M. and ASPL Thomas M. assisted the troop instructors (Sean W., Matthew S. & Brad M.) & troop guide (Daniel A.) in teaching groups of young scouts other basic scouting skills: how to build a fire, how to prepare kindling and tinder, gas stove safety precautions, lashing, knot tying and safe hiking rules. One of older scouts even completed a cooking requirement for Camping merit badge using backpacking stoves, by preparing a hot lunch for his patrol! It was a fun and productive day for all! For more great photos, click here. Though light rain and snow immediately preceded the weekend, the skies cleared on Saturday morning allowing the strong sunshine to accentuate the stunning Autumn colors of the leaves. The scenery along the Appalachian Trail was surprisingly beautiful, which made it easier to forget about the heavy pack on your back. There were several people out with their dogs on the trail, enjoying the crisp air. After a much-needed lunch break, and a brief history overview of the region’s attempt at mining iron ore in the 1800s, the scouts began to slow during the last mile into Durland Scout Reservation. Fortunately, a handful of industrious fathers had transported the voluminous camping gear (by car) up to the backpacking site. Needless to say, everyone learned a few lessons about packing lighter and about staying warm. Scouts also learned that cold weather can impact how much propane is used while cooking, the importance of following their patrol duty rosters, that dehydrated food is not so bad and that washing dishes in hot water, no matter how dirty the wash bin, is another way to keep warm! For a look at the scouts in action during this beautiful weekend, click here.